The all-wheel-drive E 53 Cabriolet carries a $81,345 base price and more visual presence than similarly priced smaller models, including the BMW M4 and Mercedes’ own C 63 S Cabriolet. That Mercedes provides an eight-cylinder soundtrack and keeps up with the E 53 in a straight line. We tested a 2015 C 63 S sedan reaching 60 in 4.0 seconds—add the convertible version to your short list if you want something sporty and don’t mind giving up the E 53’s standard all-wheel drive. Or stick with the E for a surprisingly spacious back seat. The midsize drop-top lacks rear-seat headroom with the top up, but legroom isn’t bad, and there’s room for your feet under the front seats. Most important, the top can be opened or closed even if you’re traveling around 30 mph (say, on a residential street). That flexibility and the still-ingenious Airscarf, which blows hot air on the back of your neck at three levels of intensity, leaves you with fewer excuses not to drop the top. Then there’s Aircap. When activated with the top down, it can reduce wind buffeting inside, too, and rear-seat passengers can still join you for the ride. One drawback: We found the sound of air whooshing through the system at the top of the windshield to be a tad loud. With the top up, the E 53 does an admirable job reducing noise except, of course, from the $1,250 AMG Performance Exhaust system—I wouldn’t buy an E 53 Cabriolet without it. The E 450 will lack the E 53’s engine sound and electric anti-lag compressor, but that 362-hp “base model” will have no problem accelerating to oh-my-goodness speeds before you know it. About that electric anti-lag compressor, you’ll barely notice the way it temporarily kicks in another 21 hp and 184 lb-ft of torque, but transitions to engine stop/start can be disconcerting, as our tester would occasionally roll backward ever so slightly before the tech would engage. Inside, the E 53 Cabriolet earns its as-tested six-figure price tag. Once you experience heated armrests and Airscarf, you’ll wonder how you ever convertibled without them. And the available suedelike headliner adds a premium touch in a place you’d never think to look for one. Fans of automotive ambient lighting will also appreciate this Mercedes, whose beautiful circular air vents glow in blue or red when you change the temperature and, along with the rest of the interior, can change color while you drive down the highway. Functionally, the E 53’s interior gets a passing grade, though a simpler and quicker track-forward control would be appreciated. Even though Mercedes’ controller-operated infotainment system is easy to use, small, black touch-sensitive controls on the steering wheel can adjust settings on the enormous digital instrument cluster and center-stack infotainment screens. The thumb-swipeable controls help the driver keep their hands on the wheel after taking a few minutes to get used to them. The exterior also impresses with extravagant details such as the crystal-look taillights and LED headlights that entertain before you drive off with spotlights sweeping from left to right and vice versa. Equally cool, the convertible’s EPA-projected 20/26 mpg city/highway fuel economy falls right on top of the less powerful E 450 convertible’s 19-20/26-27 mpg. Not bad for a quick convertible with an exhaust system that crackles in certain drive modes. If a loud exhaust doesn’t thrill you, try the also-quick E 450, which incorporates many of the E 53 Cabriolet’s pluses. 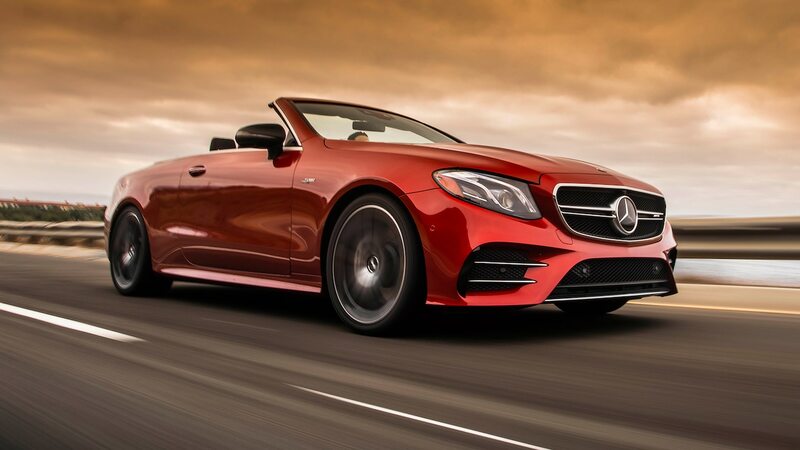 Or if sportiness is your aim, consider the smaller eight-cylinder C 63 S Cabriolet. 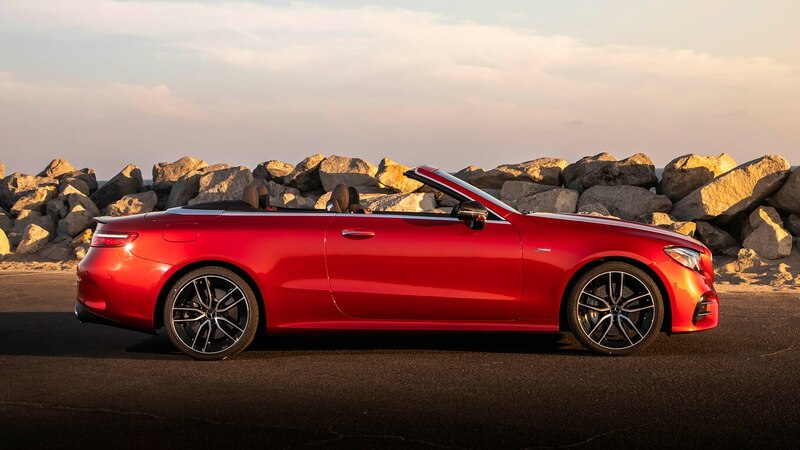 Mercedes’ extensive selection of soft- and hard-top choices will reward those who know what they want in a convertible. As for the E 53, it builds on the E 450 with even quicker performance that’s not saddled with a mileage penalty. Still, the AMG’s firmer ride with available 20s isn’t for everyone. 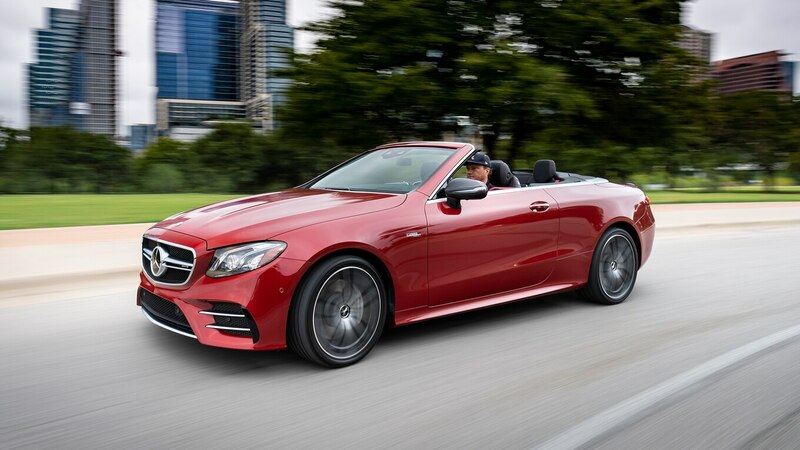 We congratulate anyone lucky enough to be considering a $100,000 Mercedes convertible. But depending on what you want from a drop-top, know what your options are before you drive off in an E 53 and drop the top.